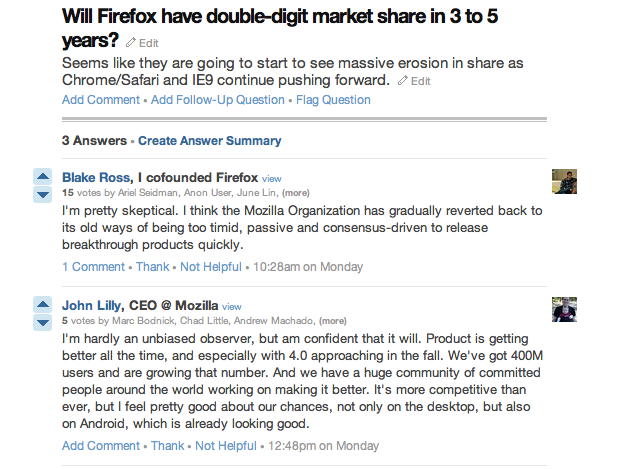 Quora is a great place to find answers about products from prominent people involved with them. It’s also a great place for those prominent people to disagree, publicly. That’s what’s happening right now in a thread about the future of Firefox. I’m hardly an unbiased observer, but am confident that it will. Product is getting better all the time, and especially with 4.0 approaching in the fall. We’ve got 400M users and are growing that number. And we have a huge community of committed people around the world working on making it better. It’s more competitive than ever, but I feel pretty good about our chances, not only on the desktop, but also on Android, which is already looking good. Ross, who is currently a Director of Product at Facebook (coincidentally working on a Quora competitor), has an argument that seems inline with his Facebook colleague (and former Parakey co-founder) Joe Hewitt. That is, governing bodies (in this case, Mozilla — in Hewitt’s case, W3C) are slowing down the development process on the web, and making it harder to innovate. 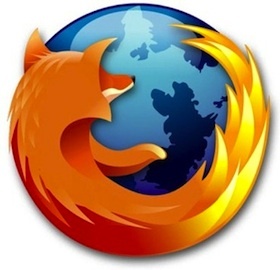 Both Ross and Hewitt have a long history in the space, as both worked on Netscape, before moving on to create Firefox. Certainly, Google Chrome is now growing at a much faster pace than Firefox is. Apple’s Safari, meanwhile, has seen slower, but steady growth over the past few years. Both of those browsers are based on the WebKit engine, which seems to be the layout engine of choice these days. Firefox doesn’t use WebKit. Instead, it relies on Mozilla’s Gecko engine. Lilly is right when he implies that the key to this argument may well be in the mobile space. The problem there is that the WebKit browsers are starting to dominate thanks to the popularity of Google’s Android platform, and Apple’s iPhone (and BlackBerry will soon have a WebKit browser as well). An early build of Firefox for Android is out in the wild, but it will take something really impressive for people to use it instead of Android’s built-in WebKit browser. Apple, meanwhile, has started to let on alternative browsers as well — notably, Opera. But again, it will be hard for any browser to beat the tightly integrated built-in browsers (and who knows if Apple would even let a mobile version of Firefox in the App Store). Some at Google disagree with Hewitt’s assessment of the slow-moving web. But again, that’s at Google, where they do seem to be pushing things faster than Mozilla currently is. Can Hewitt’s and now Ross’ criticism shake them out of the malaise?